Salvage logging—removing trees from a forested area in the wake of a catastrophic event such as a wildfire or hurricane—is highly controversial. Policymakers and those with an economic interest in harvesting trees typically argue that damaged areas should be logged so as to avoid “wasting” resources, while many forest ecologists contend that removing trees following a disturbance is harmful to a variety of forest species and can interfere with the natural process of ecosystem recovery. Brief case studies from around the world highlight a variety of projects, including operations that have followed wildfires, storms, volcanic eruptions, and insect infestations. In the final chapter, the authors discuss policy management implications and offer prescriptions for mitigating the impacts of future salvage harvesting efforts. Salvage Logging and Its Ecological Consequences is a “must-read” volume for policymakers, students, academics, practitioners, and professionals involved in all aspects of forest management, natural resource planning, and forest conservation. "The question of whether or not downed trees should be cleared from forest areas is one on which there has been much controversy. Large areas of forests can lose trees due to storms, fires, flood, insect infestation, even volcanoes. Lindenmayer (ecology, Australian National University) Burton, of the Pacific Forestry Centre in British Columbia, and Franklin (ecosystem analysis, University of Washington, Seattle) examine the question from both economic and ecological viewpoints. They consider the various reasons for the wood to be downed and the value of salvaging it rather than cutting down living trees. The conclusions over all indicate that salvaging downed trees has a more negative ecological impact than even clear cutting, threatening species and retarding the renewal of the forest. They suggest ways in which these effects can be mitigated but in most cases, they feel the cost of salvaging wood is high." 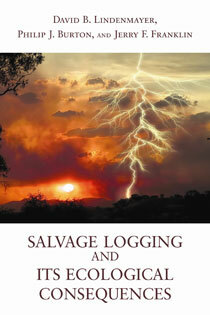 "This book is a strong and timely contribution to the discourse surrounding salvage logging. Policy makers, managers and ecologists alike will find this an indespensible introduction to the issue." "An informative read as a lay person and it is surely a must-have reference for forest professionals and resource managers." "This book presents an excellent overall coverage of its broad subject matter, with a variety of perspectives, relevant examples, and sound science; it is thoughtfully written, and should prove equally useful to students, researchers, managers, and public stakeholders alike."